QGSSSA participates in the annual Interstate Challenge Tournament, and is Queensland’s sole school sport association involved. The competition offers an elite opportunity for QGSSSA-enrolled girls to represent the Association, competing against the best open-age school athletes from Girls Sport Victoria (GSV), Independent Sporting Association NSW (ISA), Independent School Sports Association (IGSSA NSW) and Independent School Sports Association (IGSSA SA). In 2019, Netball, Football and Tennis will be contested between State Associations at Chevalier College in Bowral, NSW, from 27-29 September. Nominations are open for players, coaches and managers for 2019. Click here to nominate for a Coach/Manager position. 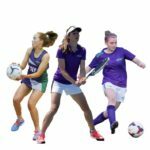 Girls nominating for a QGSSSA Representative Team must be currently enrolled in a QGSSSA school, and must currently represent their school at their nominated sport. Coaches and Managers nominating should be currently teaching or coaching at a QGSSSA school. They must hold a current Blue Card. Selection trials will be held in Term 2 at central locations. All information will be sent to nominees following the closing date and after consultation with Coaching staff.